Other candidates have also expressed their willingness to fight for the cause, but have not confirmed for the march are Loren Legarda, Grace Poe � Llamanzares, Jamby Madrigal and JV Ejercito. The President has said that he can�t push for the passage of the Security of Tenure bill now pending in Congress because it would negatively affect more workers. 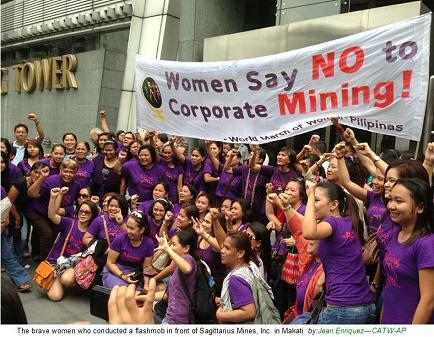 �(Pres Aquino) must be thinking that most Filipino workers are happy with their condition in the workplace � they are not. Most employees are under short term contracts, they are considered casuals or contractuals, whose jobs can be terminated at the whim of their employers and not given any benefits,� says Renato Magtubo, chairperson of Partido Manggagawa coalition. 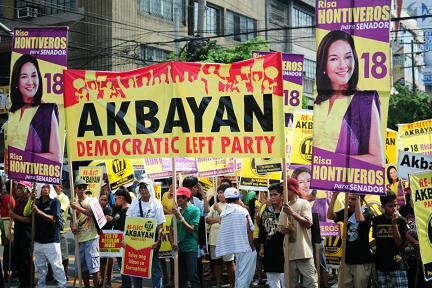 NAGKAISA encompasses the widest spectrum of colors and persuasions � from the leftist Alliance of Progressive Labor (APL), Partido Manggagawa (PM), Bukluran ng Manggagawang Pilipino (BMP), Manggagawa para sa Kalayaan ng Bayan (Makabayan) to the moderate Trade Union Congress of the Philippines (TUCP) and Federation of Filipino Workers (FFW), the labor centers National Confederation of Labor (NCL) and SENTRO, to the public sector unions Caucus of Independent Unions (CIU), Philippine Government Employees Association (PGEA), Public Services Labor Independent Confederation (PSLINK), ang many other federations. "The periodic termination of employment leaves workers and their families with very little to prevent their fall to poverty. It also has little impact on the administration's anti�poverty efforts," Bello said. Protest not celebration is the theme of the Labor Day commemoration today. 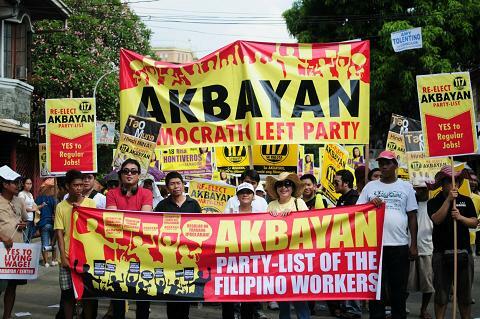 Workers groups are dismayed over President Benigno Aquino III�s (PNoy) rebuff of their demands in a dialogue yesterday. 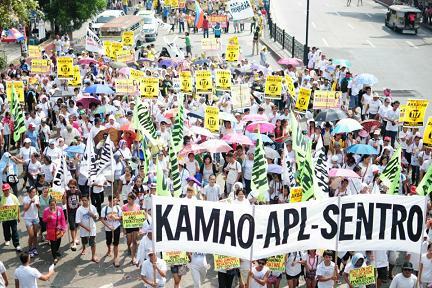 �Insults instead of non-wage benefits were announced by PNoy in the dialogue. Workers still have received nothing significant from PNoy after three Labor Days. Sa ikatlong Mayo Uno ni PNoy, bokya pa rin ang mga manggagawa,� declared Renato Magtubo, Partido ng Manggagawa (PM) chair. Hours after the dialogue, more than a hundred PM members staged a vigil at Mendiola in response to President Aquino�s rejection of labor concerns. 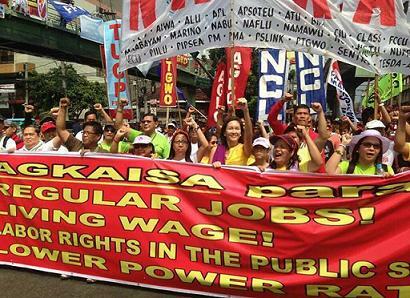 Today several thousand PM members are joining the 25-strong mobilization of the labor coalition Nagkaisa. The rallyists will assemble across the length of Espana from Welcome Rotonda to Ramon Magsaysay and then proceed to Mendiola for the Labor Day program that will last up to noon. 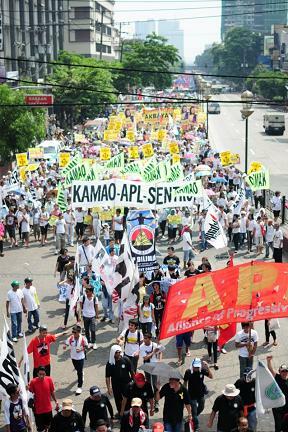 PM members will push the slogan �Manggagawa Naman� as they demand that workers� issues be a priority in the national agenda. In particular PM is advancing its �Apat na Dapat� set of concerns which are regular jobs with living wages; housing, education and health care services for all; cheaper prices of food and utilities; and equal rights and opportunity for women. Several hundred members of the Philippine Airlines Employees� Association (PALEA) will also attend the Labor Day rally. Yesterday they laid wreaths at the foot of Mendiola for Bienvenido Ruiz, an outsourced Philippine Airlines worker who died of a stroke last Sunday. �The martyrdom of Bien Ruiz, Antonio Enero, Danny Hernandez, Alfredo Limana and Arturo Estrada�who all died during the pendency our struggle against outsourcing�embolden us to fight until victory so that their deaths will not be in vain,� insisted Gerry Rivera, PALEA president and PM vice chair. What the government doesn�t say is that this growth has not been accompanied by jobs, therefore, it has not brought any relief to the poor. The growth hasn�t �trickled down� and remains in the pocket of so few, mainly the 40 Filipino billionaires who profited while rest wallow in poverty. The poverty rates alone (27% poverty incidence) have remained unchanged since 2006. This, despite the government�s Conditional Cash Transfer program, which is supposed to have alleviated poverty in the country. The CCT program, as any other program of the Aquino program, has clearly failed. Today, the PNoy government is offering instead a �job fair� that aims to dispense 400,000 jobs to the masses. This is clearly a joke in a country with 3 million people unemployed and 8 million still counted as underemployed! The government is not even considering wage increase for the workers. During the �breakfast dialogue� with labor leaders, PNoy is set to announce a set of non-wage benefits which surely will look like another joke, just like the �job fair�. These would amount to an increase of the �social wage� that will be a boon to the masses, but will not hurt the pockets of small entrepreneurs. It takes political will for the government to do this, as the increase of the �social wage� will have to be shouldered by taxing the rich (start with the 40 Filipino billionaires) and by declaring a moratorium on foreign debts. APL and PLU want to link arms with the more than 400 workers � mostly crane operators and stevedores, and many are contractual or outsourced labor � who downed their tools last March 28 to demand for higher wages and better working conditions. We fully recognize that your demands for at least 20-percent pay rise and other benefits are just and reasonable to catch up with inflation after almost 20 years. Indeed, as the UHKD reveals, Hong Kong dockworkers are paid less than they earned in 1995 as they are merely paid HK$55 (US$7) an hour today or lower than the HK$60.70 they were paid 18 years ago, which was followed by a salary cut during the SARS (severe acute respiratory syndrome) outbreak in 2003. We strongly deplore the continued refusal of the port operator to meet and negotiate with the union and HKCTU because the workers are supposedly employed not by the port itself but by several subcontracting companies. But we in the labor movement and other social movements are more than aware that outsourcing and contractualization are both an old capitalist trick and an �upgraded� and more widespread neoliberal tactic being used to enable deceitful employers and corporations to prevent the workers from enjoying regular employment. Maintaining an army of non-regular workforce is highly profitable � since they receive cheaper wages, limited benefits, without security of tenure, and usually banned from joining unions. We also echo the protesters� cry of �Pay up Li Ka-shing� and �Richest in Asia, meanest in the world� as we condemn the �philanthropist�s duplicity� of Li Ka-shing, the wealthiest person in Hong Kong and entire Asia, and 8th richest in the world, who is worth $31 billion as of March 2013, according to Forbes. He is the majority owner of the Hong Kong International Terminals � where the striking workers toil but paid cheaply � since it is operated by Hutchison Port Holdings Trust (HPHT), whose largest shareholder is Li�s Hutchison Whampoa Ltd. The latter, in turn, along with another corporate partner, controls half of the capacity of Hong Kong port, the world�s third largest container port behind Shanghai and Singapore.